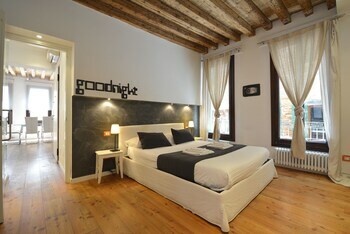 With a stay at Laura in Venice (Cannaregio), you'll be minutes from Basilica di San Giovanni e Paolo and Rialto Bridge. With a stay at this apartment in Cefalu (Old Town), you'll be steps from Osteria Magno and Church of Purgatory. With a stay at Porta terra in Cefalu, you'll be within a 5-minute walk of Osteria Magno and Church of Purgatory. Free self parking is available onsite. Located in San Cesario di Lecce, B&B Vittorio Emanuele II is a 5-minute drive from Quoquo Museo del Gusto and 10 minutes from Torre del Parco. When you stay at Settebello Village in Fondi, you'll be on the beach and 10 minutes by car from Terracina Port. Free self parking is available onsite.